I got the MCSE title! 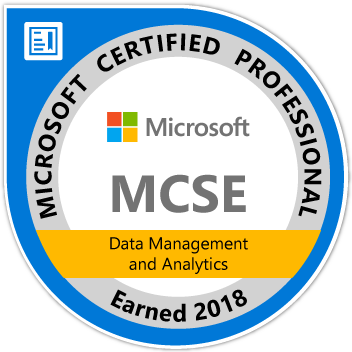 Although this post title shouts out with pride about my newest achievement–Microsoft Certified Solution Expert in Data Management and Analytics, what I really want to tell you is: Microsoft has lowered the bar of MCSA and MCSE significantly and now is the best time to get an MCSA or MCSE certificate. Three years ago, MCSA of SQL Server need three exams that cover very broad areas, T-SQL query, database administration and data warehouse. Although I was confident about my T-SQL query skills and data warehouse knowledge, I highly doubted that I could pass the DBA exam. So, obtaining MCSA title was too daunting for me. Then, MCSE was absolutely beyond my reach. Two month ago, one recruiter from TEKsystems said that I need to prove that my skills and knowledge are up to date. I took that advice and started to prepare Microsoft exams. Then, I found out that MCSA has been reduced to two exams. From my experience, the content and difficult level of these two new exams (70-761 and 70-762) only match one exam of old system. In another word, the requirement of MCSA was lowered by 66%, from 3 exams to 1 exam. At the beginning of January, I got my MCSA and MCSE was within my reach. Exam 70-767 was not easy to take, again with broad coverage of relevant content. But, it ended well by giving me a passing score. If you are planning to get a title or certificate from Microsoft, I will say it is much easier now than 3 years ago and I definitely encourage you to give a try. I have used my free and fun approach of learning again here in my exam preparation: most important material is the books by Microsoft; another important resource is free video from Microsoft Virtual Academy and cheap video from Udemy (I discussed the details in here and here). I researched one or two websites for the prep exams and I ruled them out because I don’t think doing extra exam questions are not good strategies. I’d rather read the book and understand the content with that time.